Laser cutting technology eliminates the time and cost associated with a mechanically tooled part making process and adds the flexibility to adapt or change part configurations quickly and cheaply, benefits our customers appreciate. 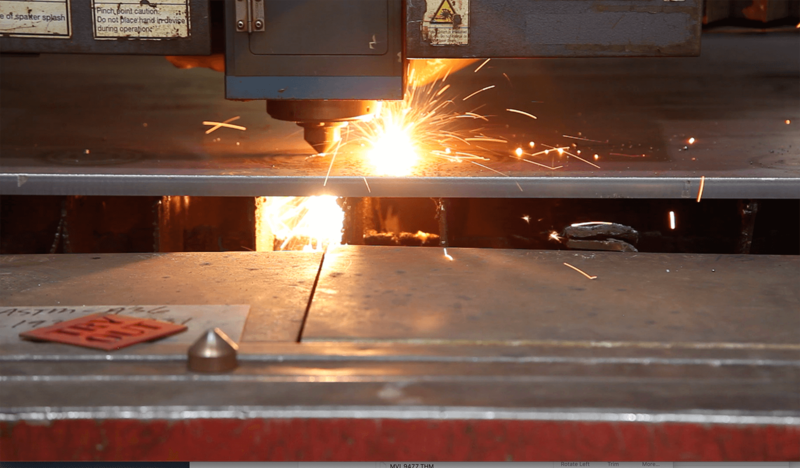 The flexibility our laser cutting processes gives our customers the capability to rapidly test design ideas. Complex shapes and features such as hole and slot, cut out sizes along with trim length adjustments can be incorporated quickly and seamlessly at every phase of the development process. When a design is not finalized, laser cutting is frequently the best production method. The versatility of adding or deleting part features is a big reason why it is so flexible. Laser cutting is used on a wide array of parts from military production applications, to complex vehicle cross associated parts. When quantities are low in volume, the laser cutting process eliminates the need to buy expensive production tooling to produce parts. The power and efficiencies of our laser systems deliver the quality and quantities you require. One of the best ways we provide value is applying our learnings from the prototyping stage where we have parts running to dimensional specifications with reduced laser cutting cycle times making us a great fit to meet your low volume production needs. Whether it is a late design change to a part at the end of the build process, a last-minute design specification which changes the shape of a part or cutout location, or the parts produced need to be modified, we have the know-how, equipment and capacity to manage these situations and more. Our pallet systems attached to our laser cutting systems making us capable of cutting large quantities at a rapid pace with short notice. Our 5 axis systems have cut over 50,000 parts in a time span of less than a month. Our flat sheet cutting equipment has cut over 10,000,000 pounds of sheet metal annually. Complex multi-surfaced parts need a laser that can cut in 5 axis patterns. Duggan has three 5 axis laser fiber cutting systems that cut complex patterns. Fiber lasers improve cut quality with traditional and exotic reflective materials. This system improves the repeatability of cutting tolerance and reduces the amount of time it takes to approve parts. A rotating table eliminates the requirement to load and unload parts, saving time and easily accommodating different volume demands. Strength: Cuts up to thicknesses from 1” steel to 3/8” aluminum. Greater efficiencies are gained from cutting a flat piece of sheet metal. Producing parts in a flat pattern eliminates the need for building fixtures and increases the speed of cutting. Using common sheet metal thicknesses, parts can also be “nested”, laying out multiple patterns on a single sheet, greatly maximizing material use. Our flat sheet 3-axis laser cutters have a pallet system holding up to 100,000 pounds of sheet steel with automatic loading capabilities. Eliminating manual loading is a significant time savings. This system is robust and has cut over 10 million pounds of material for our customers annually. We have also configured our system with 4 kilowatts of cutting power, handling material thicknesses from 3/8” aluminum to 1” steel. From lower fixture costs, higher feed rates, and increased material utilization this system delivers so much value to our customers. A common concern from customers is the edge condition on material. Nitrogen greatly increases the quality of laser cut edges. Our nitrogen generators produce enough gas to make a cutting cover gas strong enough to qualify as a medical grade cut. This is the highest grade of cut known in laser cutting. All customers benefit from the investment Duggan has made in Nitrogen. We use this process across all laser cutting processes. Wire EDM cutting is a very precise process that cuts parts within tolerance of 2 millionths of an inch. It is a versatile process of cutting flat patterns in conductive materials. Part sizes can be as large as 41”x32”x16” tall. We utilize this process for high precision parts that are typically fine blanked stampings like gears, pawls, and sectors.